Tips for Kitchen as per vastu are most essential for a peaceful and healthy house as kitchen is the place where lady of the house spends her valuable time making our daily food. So a proper positioning and setup is very essential, which will generate positive energies for the cook and the person in charge. Agni (Fire). So the kitchen must be in south-east direction of the house, with arrangement such that the cook should face east while cooking. But still you can use north-west alignment as your second choice. Gas Cylinder should be in Southeast Corner arranged in a fashion that the cook must face east while cooking. Also the gas stove should be kept few inches away from the wall. Tips for Kitchen as per vastu says you must not place the stove in front of the entrance. 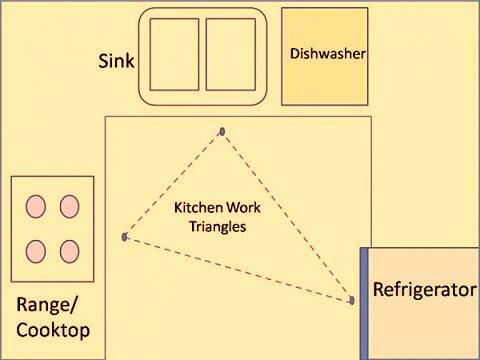 Tips for Kitchen as per vastu says preferred direction for the refrigerator is Southeast, South, North or West. corner and the water source like water filter should be kept in the northeast. Equipments like Heaters, Microwaves, ovens etc to be kept in Southeast or South. Racks and cup boards for storage should be kept in Western or Southern wall. 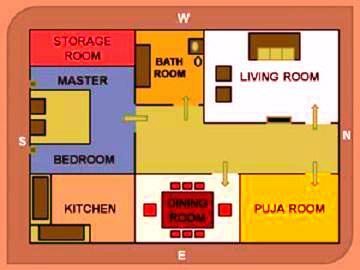 Tips for Kitchen as per vastu says Grain, pulses, and spices like commodities must be stored in the west or south. Windows and Exhaust fan should be in East direction. Tips for Kitchen as per vastu says the bigger windows should be in the eastern direction and smaller ones towards south. Tips for Kitchen as per vastu says Clocks can be put in South or Southwest Wall. 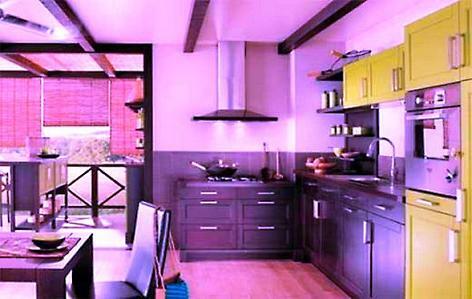 Tips for Kitchen as per vastu says Kitchen flooring should be of Ceramic tiles, Mosaic or marble. The color of the kitchen should be of light color like yellow, orange etc.